RUUD Achiever Plus Series has a furnace for everyone. With cheaper, 80% models avaliable, ranging up to 95% 2 stage options, the Achiever series is right for you. RUUD Achiever Plus Series has options that fit everyone budget and needs. Ranging from 80%-95% efficiency , there are more affordable options, as well as higher efficiency options to save you money on your fuel bills. 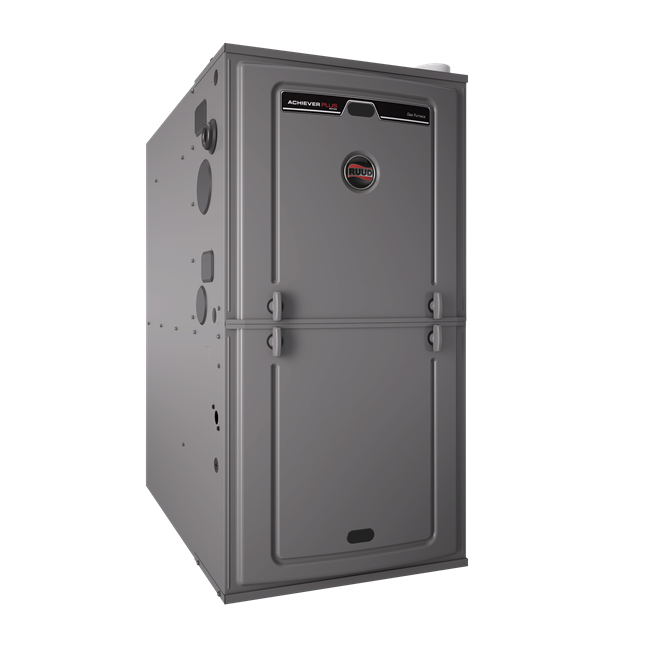 With efficiency ratings up to 95%, a Achiever Series furnace can save you money on your fuel bills over the 80% option. RUUD has included a new ignition system in their ULTRA Series furnaces, called the PlusOne Ignition system. This is a more reliable system, which means less work for you. Achiever Series Furnaces have a sturdy frame and solid doors, which means less vibrations. This makes RUUD furnaces quieter than many competitiors.